In the olden days, when I was young, the annual Autumn international jamboree attended by every national team under the sun didn’t exist. We used to welcome a single country’s rugby squad, who stayed for months on end. They toured these islands, played against club sides, regional sides, national teams and then we all said our goodbyes with a match against the barbarians. They stayed in small towns and large cities the length and breadth of the country, mixed with the locals, with the exception of Keith Murdoch, and left life long memories. They got to know us and we got to know them, warts and all, but it made the cold wet winters bearable, then as winter faded and the days started to lengthen they headed home. 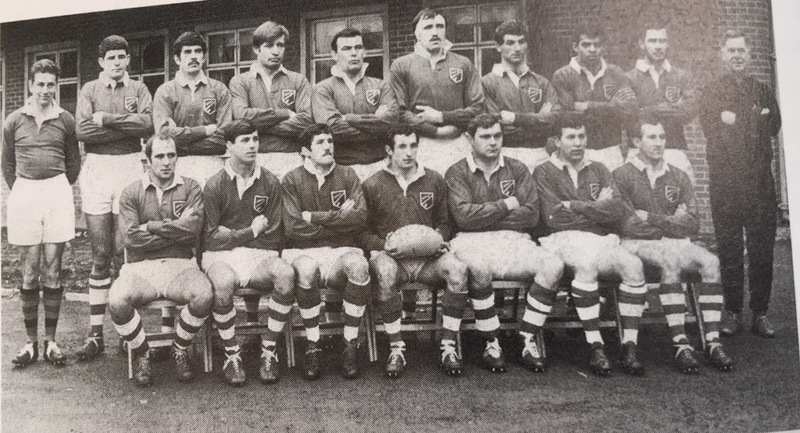 50 years ago the All Blacks toured the UK and France, a formidable and physically impressive squad they went through their fifteen match tour unbeaten. The match had originally been scheduled for the Saturday, but heavy snow fell throughout Wales, and although the playing surface was okay, the icy snow-covered terraces would have been a danger to spectators so the match was called off. 40,000 turned up on the following Wednesday afternoon, a week before Christmas, to watch a match which was expected to be an easy win for the unbeaten all-conquering all Blacks. It was an overcast day and the pitch was greasy, the more mobile East Wales pack made the New Zealand forwards look ponderous, and the All Blacks half backs were put under a great deal of pressure throughout the game. In the 22nd minute Lyn Baxter won a line-out and Barry John tried a dropkick it’s swerved away to the left of the posts but Frank Wilson followed up to beat Thorne to the touchdown. Shortly afterwards the home side could, and maybe should have, been awarded a penalty try when a diagonal kick intended for winger Keri Jones saw him race to the line with McCormack, only for the New Zealander to Barge him out-of-the-way as they reached the ball. Later in the first half Wilson went over for a try for the Welsh only to be called back for an infringement. 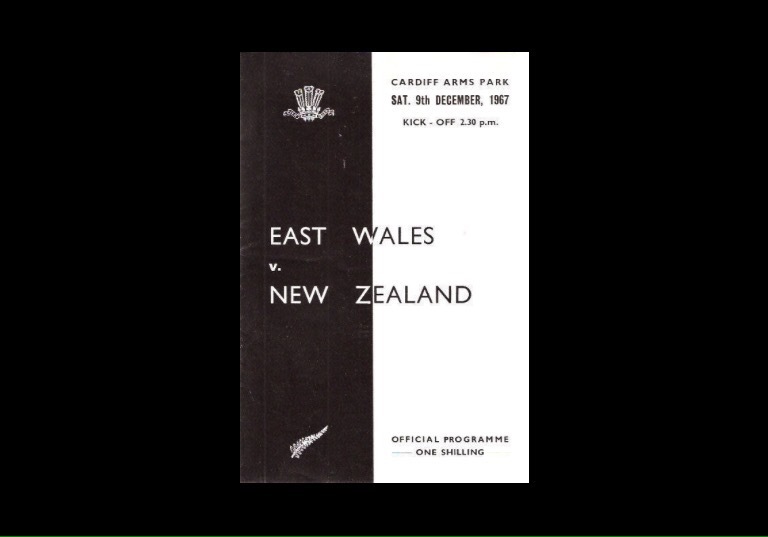 In the second-half East Wales launched attack after attack on the All Blacks line. Several kickable penalties came their way which they missed resulting in Captain Gareth Edwards taking over the kicking duties and missing two kickable penalties himself from fairly easy positions. 10 minutes from time, and against the run of play, came the Steel try that saved the All Blacks blushes. 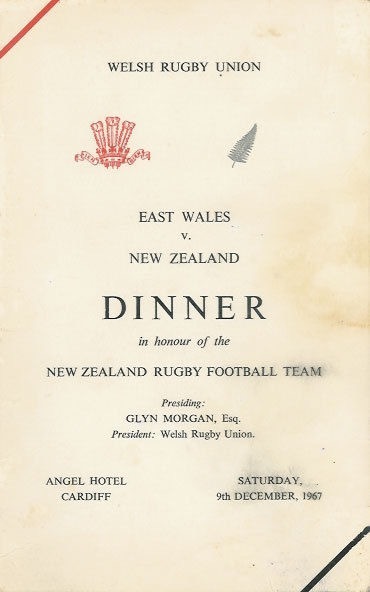 East Wales continued their onslaught on the All Blacks line, and there was almost a sensational finish when Barry John’s last second drop goal grazed the right upright. It was felt the home side should have won this game and deserved to do so but the All Blacks hung on in there and saved their unbeaten tour record. 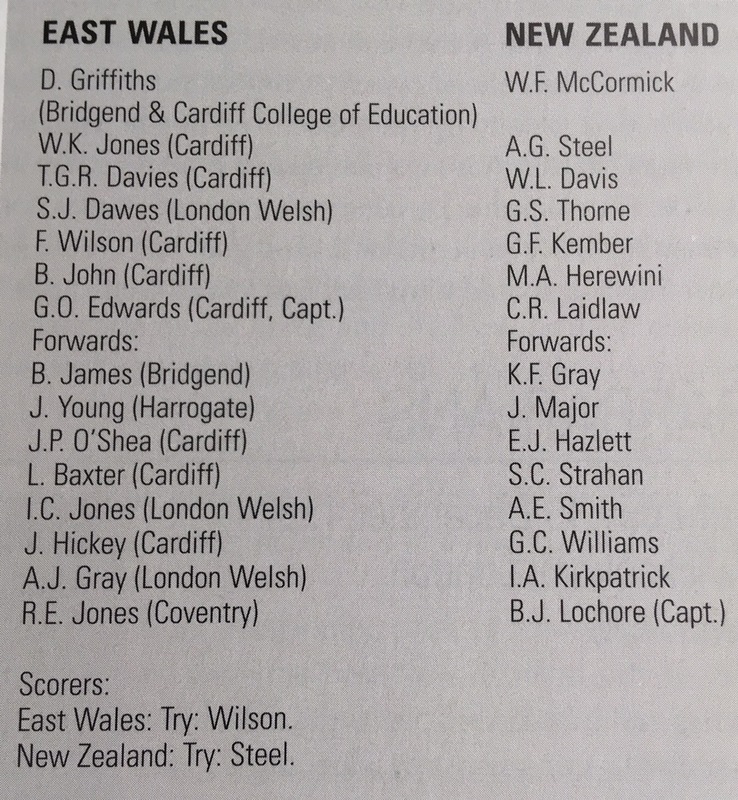 Gareth Edwards playing scrum half that day says “I was barely 20 years old though it was only a few months later that I captained Wales for the first time”. “Dai Hayward, the former Cardiff and Wales wing, was asked to coach the East Wales side, though coaching was very much in its infancy then. He said we’d better meet up and have a chat about the game, so we met in what was then the Cockney Pride, a pub in Cardiff, where over a lunch of curry and chips , we discussed our tactical approach to this enormous event. I can still remember Dai’s opening line: “Well boy, there’s no point complicating anything.” If we get hold of the ball, he said, let’s move it”. “On the Saturday of the scheduled match the whole town was covered in snow. I went down to the Angel Hotel, where we were due to have lunch, to find out what was going on. It turned out the All Blacks were staying there as well, so we had a few beers together”. “It might be a case of the old memory playing tricks, but I think we completely outplayed them and should have won it. For a long time we led 3-0 and it didn’t look for a moment like they were going to score”. “Afterwards the All Blacks manager, Charlie Saxton, spoke to us, and said they were very, very fortunate not to have lost. It was a harsh lesson for a young player like me to learn, but the All Blacks absolutely never gave up until the game was over. Tony Steel went on a great run down the wing, and that was 3-3, it was just about the only chance they had”. “Even then, Barry John had a drop-goal chance at the death that just took the paint off the upright. Had we won it, against one of the greatest teams I ever played against, people would still be talking about it with great reverence. It was a wonderful performance by a side that had been put together literally in a week”. 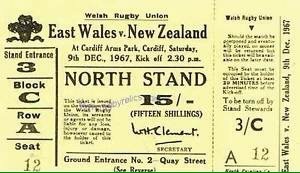 The All Blacks won 14 of their 15 matches on the 1967 tour, beating England 23-11, Scotland 14-3 and Wales 13-6.